Town defender Johnny Mullins was quick to thank his team-mates for making sure the own goal he scored at Crewe on Saturday didn’t have any bearing on the final result. The visitors were 2-0 up and cruising with just nine minutes left, when Mullins stuck out a leg to divert a cross beyond keeper Marek Stech. It’s the last thing you need, as you just want to the whistle to go when that happens, stop the game there and then, finish it. 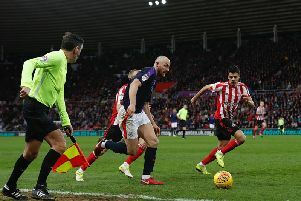 However, Luton defended solidly for the remaining nine minutes plus stoppage time, ensuring their opponents didn’t have any clear-cut opportunities, as Mullins said: “I thought their striker was behind me, hopefully on Sky Sports its gone down as his goal so I haven’t got loads of texts. “I just had to stick out a leg, I’m obviously not pleased with it, it changed the feel of the game as they were all of a sudden in the ascendancy putting balls in the box. “But we defended that very well until the end, and it’s fair to say we deserved the win. “I thought we were in cruise control, very comfortable up until their goal and we saw it out. “It’s the last thing you need, as you just want to the whistle to go when that happens, stop the game there and then, finish it. But thankfully we got through it and I think it’s testament to the character of the lads as they sort of dug me out of a hole. Boss Nathan Jones added: “When that happens and people throw bodies forward, they launch balls in and have got big players, they get flick ons, it can land anywhere, so it’s a bit of a lottery at the end. “But I thought we saw the game out well, frustratingly for them how well we saw it out, but I’m delighted and it’s a great win. “We’ve shown we’ve come a long way we really have as even though we won 2-1 last year, this was a game that was a really tricky one, but we’ve finished the month fantastically well.